Dental crowns and dental bridges are teeth restorations that improve the form and function of teeth that have been damaged, discoloured, or decayed. Dental crowns and bridges treatment by a Kent dentist enable a person with damaged teeth problems to enjoy normal activities such as eating, chewing, and smiling – without the embarrassment and discomfort brought about by unsightly teeth damages. Dental crowns are caps that very closely resemble the appearance of natural teeth; these caps are used to cover the affected tooth to improve the overall form and function. The dental crown will effectively cover the tooth through the gum line, and is cemented firmly into place to ensure strength and durability. Woodbury Dental and Laser Clinic Kent dentists use both all-porcelain crowns and porcelain-fused-to-gold crowns (a gold crown that is covered by porcelain). The porcelain used in the dental crowns matches the shade of a natural tooth. Since more light is reflected in the front of the mouth, all-porcelain crowns look more natural when restoring front teeth. 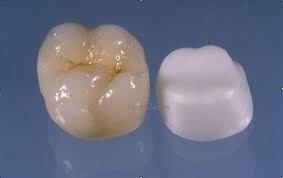 Crowns are custom-made in a laboratory and are cemented in place. Broken or worn teeth that have become unsightly in appearance, and have been weakened by the damage. Dental crowns are ideal solutions to restoring the form and function of broken or worn-out teeth, making them functional and attractive once more. Decayed teeth can be saved from further damage with the help of dental crowns by a Kent dentist. The decayed part will first be removed to ensure that the infection or decay does not spread to the other tooth parts that are still healthy, before the dental crown can be put in place. A cracked tooth can be remedied with a dental crown, which works in saving the rest of the tooth from being cracked and damaged even further. Irregularly-shaped or misshapen teeth can be improved with the help of dental crowns. The dental crown is used to cover the affected tooth (or teeth) to alter its shape, making it a part of a more attractive smile. Teeth that are badly-stained or discoloured can be covered with dental crowns, especially if the stains or discolourations cannot effectively be remedied with teeth whitening treatments anymore. A dental crown resembling the appearance of natural teeth is used to cover the stained or discoloured tooth to improve the smile’s overall aesthetics. A tooth with a large filling can be covered with a dental crown so that the tooth can have the adequate support that it needs; this is especially true if the dental filling covers a larger portion of the tooth, compared to the existing healthy portions. Dental crowns are ideal teeth restorations that can be attached to dental implants, to replace the form and function of missing teeth. A dental bridge by the dentist at Woodbury Dental and Laser Clinic is a fixed partial teeth restoration, used to replace both the function and the form of lost teeth. The bridge is attached to existing natural teeth on both sides of the gap that was created by missing teeth; the dental bridge will then close the gap caused by lost teeth. Dental bridges are created with form and function in mind, so they replace the function of missing teeth while restoring the attractiveness of a smile – even after experiencing the loss of one or several teeth. Dental bridges are made to resemble the appearance, shape, and colour of the existing natural teeth – so that the overall smile looks naturally beautiful, without being obvious about the presence of the dental bridge. The procedure for the placement of dental bridges will usually take just two visits to the dentist, which means that the whole process will not take too much off your busy schedules. After just two dental appointments (depending on the individual case), you can enjoy a more complete, and more attractive smile with the dental bridge in place. A dental bridge also aids in speech improvement, as the ability to speak properly will largely be affected by missing teeth concerns. Once a dental bridge is successfully put in place, you will be able to speak clearly and properly again without any difficulties. Dental bridges are made to last a very long time – usually for an average of 10 to 15 years. The length of time that the dental bridge will last will also be dependent on good oral hygiene practises, as well as regular visits to the dentist at Woodbury Dental and Laser Clinic, to ensure that the dental bridge is maintained in its optimum condition.